After numerous and varied experiences while traveling personally for youth sports events and completing several recent feasibility studies for hotels and resorts with sports facilities, it is clear that the relationship between the sports travel industry and the hospitality industry is significant. In order to understand this relationship, trends in sports participation, with particular attention paid to trends in sports spending, need to be analyzed. Weekday versus weekend group demand at hotels and the sports group consumer’s attitude toward the entire ‘travel-for-tournament’ experience are important issues in preparing a hotel feasibility study or a sports facility feasibility study. Each year, the Physical Activity Council (PAC) produces a Sports, Fitness and Leisure Activities Topline Participation Report that is a result of the partnership of six major trade associations within the U.S. sports, fitness, and leisure industries. Each association partner produces detailed data on its specific areas of expertise, and submits its overall participation data to this “topline” report. These six associations are the International Health, Racquet and Sportsclub Association (IHRSA), The National Golf Foundation (NGF), The Outdoor Foundation (OF), The SnowSports Industries America (SIA), The Sports and Fitness Industry Association (SFIA) and the Tennis Industry Association (TIA) in collaboration with the United States Tennis Association (USTA). The major focus of the report is to “establish levels of activity and identify key trends in sports, fitness and recreation participation in the U.S.” Hotel & Leisure Advisors is a member of the Sports and Fitness Industry Association (SFIA), which publishes various research reports. According to the recently released 2013 Sports, Fitness and Leisure Activities Topline Participation Report, 28% of the population of Americans age 6 and older are inactive, meaning that 72% of Americans are active. The report breaks down the number of active Americans based on low- to high-calorie activities and beyond. The results of the study indicate a figure of 33% of Americans or 94.8 million individuals age 6 and older are active to a healthy level and beyond. Who among the 94.8 million are most likely to travel for sports on the weekends and require lodging accommodations? This demographic includes those who participate in team sports, and typically those who are identified as “core” participants. A core participant is an individual who engages in his/her particular sport at a higher level than casual play. The core participant includes the regular and frequent player. The industry definition of what constitutes a core participant varies with each sport. 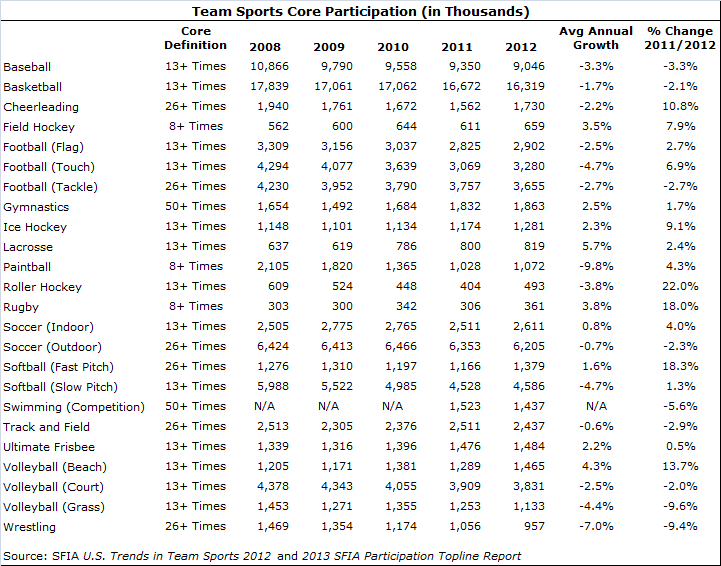 The following chart identifies growth rates in various team sports for core participants. Out of the 24 team sports where participation is tracked by the SFIA, nine have achieved positive average annual growth rates across the five-year period. A total of 15 team sports achieved positive growth rates in 2012 over 2011. Of the team sports with more than a million participants, most notable increases were achieved in cheerleading, ice hockey, fast pitch softball, and beach volleyball. Participation growth has been trending positive in all the team sports with less than a million participants, including field hockey, lacrosse, roller hockey and rugby, identifying these sports as potential growth areas. The above chart is a snapshot of the entire United States. Within certain geographic locations, the growth trends for a particular sport can vary greatly. A site-specific study can determine the strongest growth trends for a particular team sport in a given region. For example, the Middle Atlantic region is a hotbed for the sport of lacrosse, capturing more than 45% of all lacrosse participation in the U.S., according to the SFIA. Spending patterns related to sports, fitness, and leisure activities are another key component to understanding the relationship between the hospitality industry and the sports travel industry. The 2013 Sports, Fitness and Leisure Activities Topline Participation Report profiles spending trends in 12 categories. Of interest to hoteliers are the categories of spending in “Team Sports Outside School” and “Travel to Take Part in Sports & Recreation.” These two categories match the profile of the sports participants who engage in their sport with enough frequency and dedication to travel beyond their home area to participate. 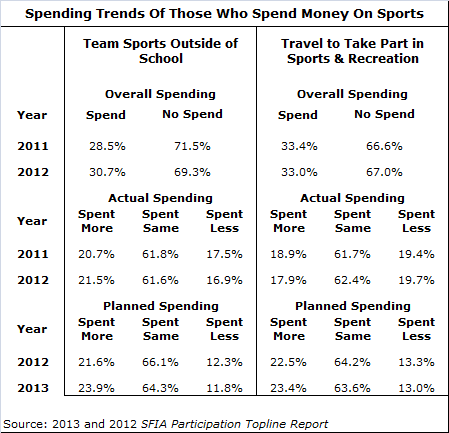 The following chart identifies the spending trends of those who spend money on sports in these two categories. The percent figures shown in the categories of actual spending and planned spending are based on the percent of overall spending; i.e. the percentage figures reflect only those that actually spent or planned to spend money on sports. Over the two-year period, overall spending for “Team Sports Outside of School” increased from 28.5% to 30.7%. This increase was the direct result of participants spending more in 2012 than they did in 2011. This category includes club play with potential year-round commitments. In the category of “Travel to Take Part in Sports & Recreation,” the overall spending between 2011 and 2012 decreased slightly from 33.4% to 33.0%. Statistically, this is considered “flat.” This decrease was reflected in minimal decreases in two of the three spending categories. Forecast trends for 2013 indicate planned increases in spending for both categories. Considering trends in both team sport participation as well as spending, the future for core sports participants to spend money outside their local community on items such as lodging accommodations is promising. Recent interviews for feasibility studies our firm has conducted reveal parents with child athletes recognize trends toward sports specialization early on with increased levels of commitment to participate in club and travel-related programs. Parents are providing better experiences for their child athletes than they had themselves. While local league play provides for the majority of revenue at a sports complex or venue, a significant source of additional revenue can be made through the offering of tournaments and showcase events. It is through these events that sports group demand is generated for the local lodging accommodations. Tournaments and showcase events are typically multiday events that have a broad economic impact on a particular area and/or region. The National Association of Sports Commissions (NASC) was established in 1992 as the lead association for the sports travel industry. As its mission the association “provides an outlet for communication between sports commissions, CVBs, event rights holders, and suppliers to the sports and travel industry.” According to the NASC’s 2012 Report on the Sports Travel Industry, there is a synergistic relationship between sports commissions and CVBs because sports commissions “are interested in attracting and producing sports events” while CVBs place more importance on the generation of room nights. These two types of organizations work hand in hand. With more than 600 organizations as members of the NASC, the sports travel industry is big business. Many of the CVBs that we have interviewed across the country either work with their local sports commissions (if they exist) or leverage their region’s specific inventories of sports venues and amenities to address the needs of the sports industry from a tourism point of view. Those hotel properties that do not embrace the sports tourism market are missing out on potential revenue that if managed properly can be a significant source of a hotel’s success. Hotel & Leisure Advisors’ research of lodging demand for sports groups indicates that significant compression occurs centric to the sports venue hosting the event. Booking rooms at properties more than 45 minutes from the tournament venue in order to accommodate a large block of rooms is not uncommon. Many tournament organizers will arrange packages with preferred hoteliers providing ease of booking and coordination for tournament participants and their families. The manner (room rebates, stay-to-play, etc.) in which local hotels are engaged in the sports travel industry is a discussion beyond the scope of this article. Another key aspect to sports group demand is that the typical weekend youth sports participant is traveling with his/her parents as well as siblings. The opportunity exists to capture more per capita spending at a property through its food and beverage and sundry outlets. Some hoteliers we have interviewed have reported that the sports group market is not a good fit for their properties, and the weekend youth that arrive and depart are more of a hassle than they are worth. However, our research shows that hotels can gain occupancy points and additional departmental revenue from sports groups. Sports group consumers are prudent spenders. Like other typical consumers they seek the best deal available to make their discretionary purchases last. Sports group consumers are also seeking more than just a hotel room. Many parents who have made the decision to travel for their child’s sport activities also take the opportunity to view the weekend travel as a mini vacation, and don’t necessarily want the rock-bottom experience. Both limited-service and full-service properties have amenities and offerings that when tailored to the expectations of the sports group consumer result in travel experiences that are memorable. Successful hoteliers in the sports group market recognize the weekday-weekend shift that occurs in hotel operations due to having a sports team on property. Our interviews with hoteliers and the sports group consumer reveal several interesting issues that are central to the relationship between the sports group consumer and the lodging property. Location and proximity to the sports venue is a key aspect for the sports group consumer. The hotel that can provide clear, concise, preprinted directions and accurate travel times to the venue(s) can alleviate early-morning angst for teams. In order to properly ensure this happens, hotel operators should understand the weekend event inside and out, to the point of potentially having live updates for schedule changes, results, etc. The more informed the hotel is regarding the event, the better prepared it is to assist teams in managing their weekend schedules. Food and beverage spending is another key aspect in the relationship. While limited-service properties typically include breakfast, full-service properties that offer sit-down breakfast in their restaurant can shift their focus by providing a lower-cost breakfast buffet service on the weekends. Likewise, offering a team a lower-cost family pasta buffet is another option that can keep the revenue in house and provide an efficient method for team meals. In addition, hotels that leverage their relationships with local restaurants to provide delivery services and catering can be a benefit to sports group consumers. 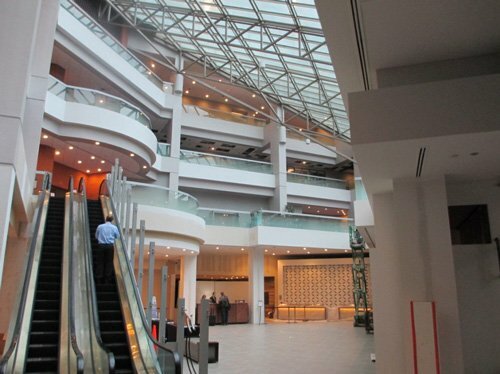 The ability for a team to have its own space within a hotel property is another amenity that is desirable among sports groups. This is typically a meeting room that is properly booked and scheduled so that teams can use it for a variety of reasons such as team meetings, receptions, and/or private dining (buffet) options. This amenity is popular with club-level organizations that bring multiple teams of various age levels to tournaments. As another example of dedicated team space, one hotel we interviewed has purposely built oversized storage areas on each floor to accommodate team equipment. Upon check-in the team manager is given the key to the storage room and all team gear is stored there for the duration of the stay. The storage room concept keeps the gear out of the guest rooms and increases efficiency for the team prior to their scheduled games. It also reduces wear and tear on the guest rooms. Several properties we’ve interviewed take the sports group experience to the next level through a simple gesture of team recognition with welcome placards. One director of sales at a full-service property stated that they cross-reference their sports group guests with their brand loyalty membership to identify and recognize corporate brand-loyal customers returning as leisure guests. 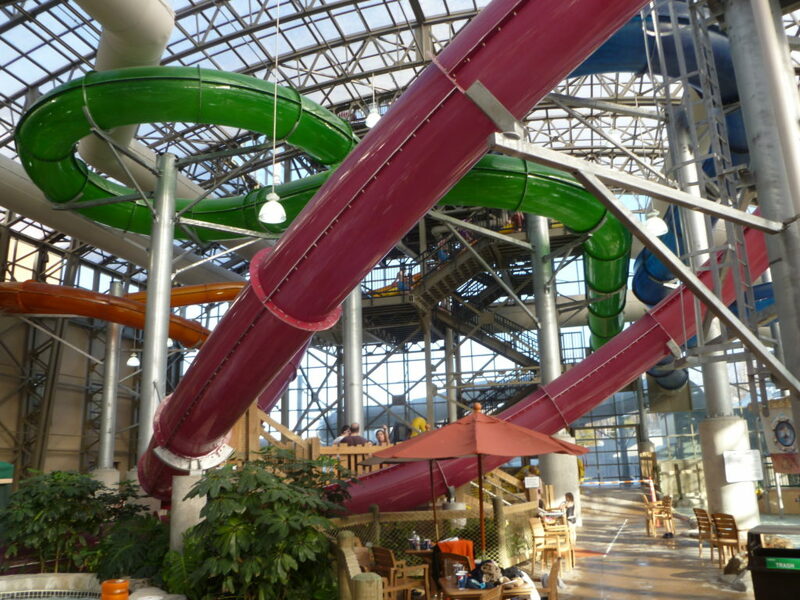 In addition, some hoteliers secure team discounts for other local leisure attractions and activities within the market. These gestures are viewed as value added to the guest experience. The points of consideration outlined above are those that have risen to the top in our research and feasibility studies within the sports group market. It is not only the hotel experience, but the overall local experience that plays a role in determining future participation in a specific sports tournament or event. While not as experienced as typical corporate travelers, sports group consumers are becoming more sophisticated when it comes to desired amenities from their lodging accommodations. It is important to embrace sports group consumers in a manner that will keep them coming back year after year. The trend in traveling for youth sports events will likely continue to increase because parents with dedicated and committed athletic children are now engaged on a year-round basis with their child’s primary sport. Hoteliers who recognize these sports participation trends can achieve higher revenue and attract new demand segments. Eric B. Hansen, AIA, ISHC is the Director of Development Services for Hotel & Leisure Advisors, a national hospitality consulting firm. Mr. Hansen is active in preparing appraisals, market feasibility studies, economic impact studies, property condition assessments, and impact studies for hotels, resorts, waterparks, sports facilities, golf courses, conference centers, and other leisure properties. Mr. Hansen offers more than 18 years of experience in the hospitality industry. As a hospitality consultant with a foundation in consulting, architecture, financial management, and appraisal theory, Mr. Hansen brings well rounded expertise to various H&LA assignments and assists H&LA clients with their pre-development, consulting, and valuation needs.